The last few years have seen an explosion of digital mapping on the web, but for some reason the cartogram has been largely left out. And it’s too bad because in many cases they are a far superior way of representing information than maps that do so using color alone. A cartogram is a map in which some variable (population, GDP, etc) is substituted for land area. For comparison, a more common way of representing this type of information on a map is to do so using color. This type of map is known as a choropleth. This first example is a choropleth displaying the 2050 population projection of each country. It is from the website of the Population Reference Bureau (an organization I have a lot of respect for). 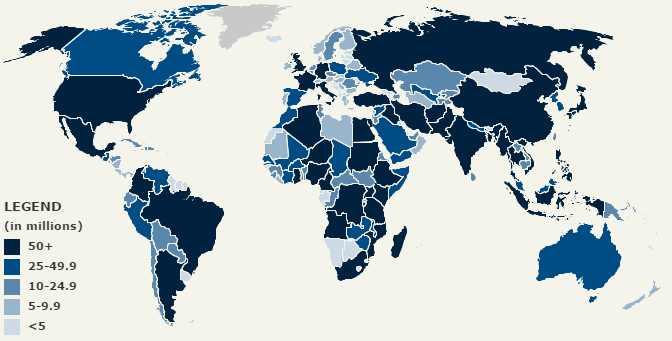 By looking at the map, it’s clear which countries are the most populous. However, the map does not convey a sense of magnitude. The legend shows the values that correspond to each color, but how much do those values actually contribute to what you glean from the map? Choropleths are great for conveying simple comparisons (“does area A have more or less population than area B?“), but they don’t do a great job of answering the question, “by how much?” They may also conceal the importance of small regions, which may not be clearly noticeable. By looking at the map, would you know that in 2050, the 3rd most populous country in world is projected to be Nigeria? This next map is a cartogram that displays similar information, the 2100 population projection of each country. Here, there is no mistaking that India and China will remain the two largest populations, and that Nigeria is right up there. 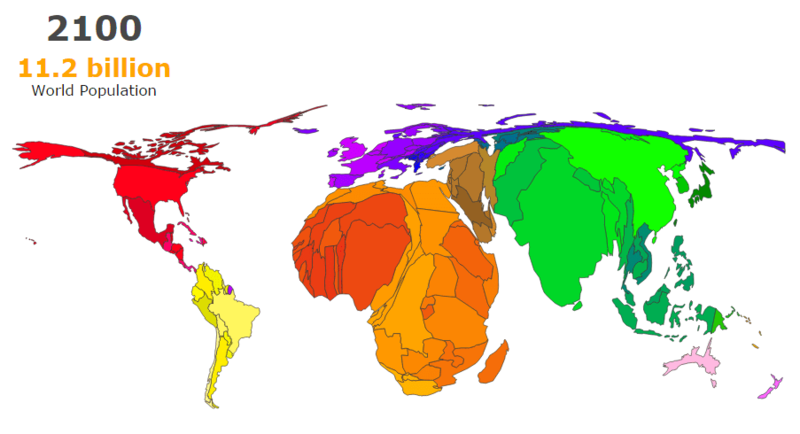 The problem with cartograms is that the distortion can make the different regions harder to identify. This is where animation can be helpful. A cartogram is useless if the map is distorted beyond recognition. Animation can help put the pieces in context, and make them recognizable again. This animated cartogram shows the total residential property value of every county in the U.S. If it were just the static cartogram, without the animation, it would not even be clear you were looking at the U.S. This is not going to make much sense without a basic understanding of GIS (GIS basics / resources). There are many methods for creating cartograms, but I’ve found the best tool to be Scapetoad. But before using it, there is some necessary prep work. First, you need to make sure your mapping variable (for this example, the mapping variable is 2100 population projections) is included in your map’s attributes. In QGIS, you can accomplish this with a table join. Make sure QGIS recognized your mapping variable as a number. To do so, open the CSV’s attribute table. If the numbers are aligned to the left, QGIS thinks they are strings, and you may have to reload the CSV file along with a CSVT file that specifies the data types. Open the boundary file’s Layer Properties dialogue, and join the CSV file. The Join Field and Target Field are your “join ID’s,” the fields that you want QGIS to match-up (in this case, they should both be the name of the country). There is one more important step that is easy to overlook. Save the file in shapefile format, using the same CRS that you plan to use for displaying the map. Otherwise, the cartogram will not have the correct proportions (how different map projections can distort relative sizes). Now, you’re ready to make the cartogram. Scapetoad is very easy to use. Just load the shapefile and follow the instructions. The only wrinkle is that sometimes the sizes do not come out accurate. I ran into this problem while making the residential property value map shown above. Manhattan is so small and its property value is so big that Scapetoad algorithm was not able to “grow” it to the proper size. So, look carefully over the error statistics after the file finishes running. Usually I have been able to reduce the error by playing with the settings, but other times I have had to adjust the shapefile manually, spreading things out, before handing it off to Scapetoad. To display your map using D3, it needs to be in geojson (or topojson) format. Scapetoad outputs the map in shapefile format. It is easy to convert from shapefile to geojson using QGIS, but I prefer to use Mapshaper. It is simpler to use and it also makes it easy to simplify the map, reducing the size of the file while retaining most of the quality. This is not going to make much sense without some familiarity with D3. With D3, it is dead simple to create animations, using the transition method. From start to finish, animating this circle involves only 4 logical lines of code. Click to view the source code. In theory, transitioning between two polygons should be almost as easy as these circle transitions. The method is essentially the same. However, it only comes out looking right if the polygons are properly lined up with each other. For example, here is a simple attempt to transition between the USA and cartogram-deformed USA. The transition breaks down because D3 does not know how to line up the two polygons. In this case, you can see it associates the bottom of the first polygon with the top of the deformed polygon. Even if you were to line up the polygons properly, it is unlikely they would have the same number of points, which can cause discontinuities in the transition. For a clean example of a shape transition see: transition between California and a circle. In the case of the USA transition, you could fix the transition by manually rotating the borders to line them up, and by adding a few extra points where they are needed. But that is not ideal if you are working with a world map with over 100 countries, since you would have to repeat this process for each one. Also, even if you were to line all the polygons up properly, there will likely still be some sections of the map that appear to rotate. When you are transitioning many countries at the same time, this may lead to the borders not lining up, causing gaps between the polygons. For this map, I spent a lot of time manually adjusting the polygons to avoid this problem. But if you look, you can see gaps between the countries as they are transitioning. To truly make the animation smooth, we have to throw out the cartogram from Scapetoad and go back to the drawing board. This time, the output we want from Scapetoad is not the cartogram itself, but a deformation grid, which we can use to make the cartogram ourselves. The process for creating the deformation grid is the same as the one described above for creating a static cartogram. The only difference is that in the process of creating the cartogram, you have to simultaneously transform a lattice of grid points (see images below). The grid on the left is just a 100 x 100 grid of points that uniformly cover the world map (with the standard WGS 84 coordinate reference system). Download example grid in shapefile or csv. To deform the grid, you can run a simultaneous transformation in Scapetoad. 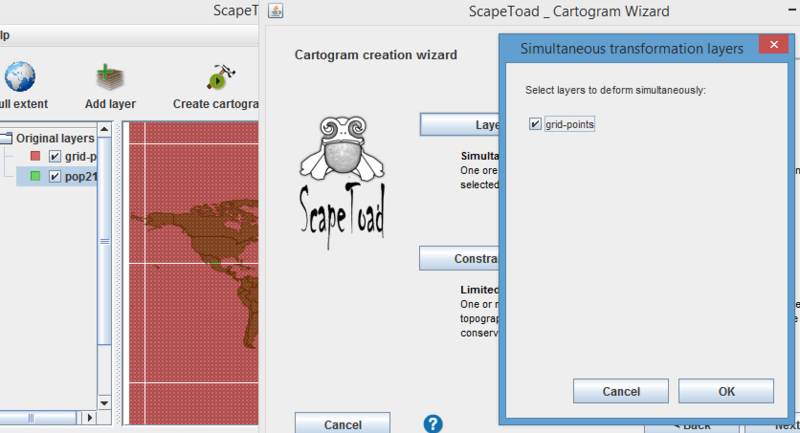 When Scapetoad finishes running, it will produce two outputs: the cartogram map and the deformed grid. You probably want to save them both, but the grid is the only one that is needed. Convert the grid from shapefile to csv. You can convert it in QGIS using the MMQGIS plugin. It will look something like this (download deformed grid in csv). Bring the deformed grid and the original grid into Excel. Now, if you match up the points between the two files, you can calculate the offsets for each point. Save these offsets as a new file, which will look like this (download final deformation grid). The next step is to deform the map yourself, point-by-point, using the deformation grid. Since the points in the map will not lineup exactly with the points in the deformation grid, the code below uses bilinear interpolation. This cartogram should look like the one created by Scapetoad. However, it is better suited for animation via D3 because its points match up one-to-one with the points in the base map. 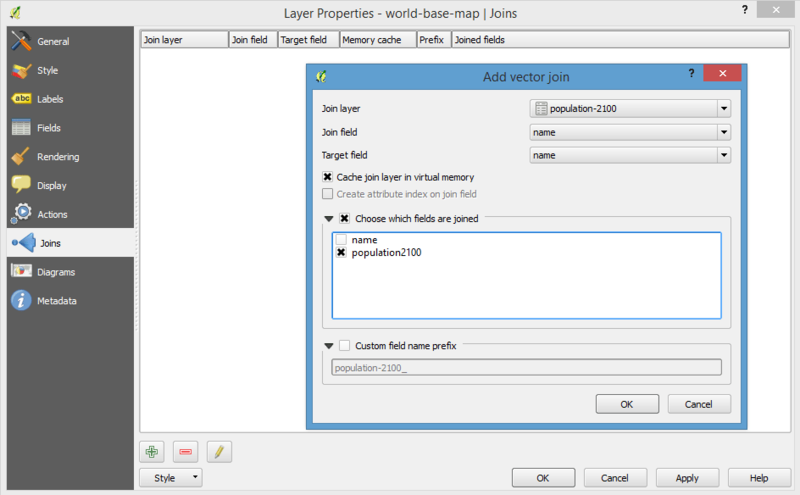 The example above takes as input only the base map (download basemap as geojson) and the deformation grid created above (download deformation grid as csv). One final note. To make sure the transitions function smoothly, it is best to convert the polygons from geographic coordinates to SVG coordinates before displaying them. Otherwise, D3 will resample the points on its own, and the two maps may no longer line up properly. Here is the code for the conversion from geographic to SVG coordinates (line 167 in the source code). Previous Article How Much is 70 Hot Dogs? Results from Nathan’s 4th of July Eating Contest. Thank you so much! This is exactly what I want! Glad it’s helpful. Have been meaning to type this up for a while. Very graphic and understanding way to illustrate a data info to an audience. I was looking for a way to do something like this. Thanks for showing me the path to try to learn how to do it . This is great! But is the source code no longer available? Looks like Chrome no longer lets you link to html source code. If you copy the URL and paste it in manually, it should work.